Print the template out. Have the kids cut it out. Laminate it or you can just print on card stock. 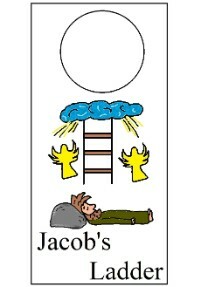 Use this Doorknob hanger craft to go with the Jacob's Ladder Sunday school lesson. Comes with a coloring page, recipe, clipart, name tags, cupcake template, find the difference, and so much more. We have more Sunday School Lessons with Bible Coloring pages and really fun and unique Bible Recipes for kids. We also have Christian clipart and puzzles. See more Bible Doorknob Hangers?